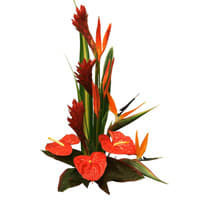 Send online to your favourite people this Magnificent Blend of Happiness Birds of Paradise and Anthuriums Arrangement and make their day more bright and happy. Mixed Arrangement with Lilies and Assorted Cadburys Chocolate. Mixed Arrangement with Lilies with 500 grms Assorted Sweets. Mixed Arrangement with Lilies with 16 pcs Ferrero Rocher chocolate box.